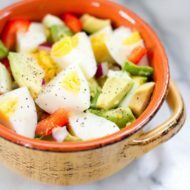 This avocado egg salad uses avocado instead of mayo for a healthy and creamy egg salad that’s perfect for sandwiches, wraps or topping a salad. 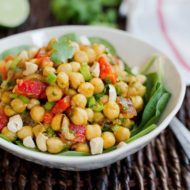 You’ll love the sweet and spicy flavor that the curry powder adds as well. I don’t remember where I first saw a recipe for egg salad made with avocado instead of mayo (probably Pinterest), but Isaac and I aren’t big mayo fans so this idea appealed to me. I put it in the back of mind and when I thought about making egg salad this weekend I decided to try it out. I used my go-to curried egg salad recipe but instead of using regular mayonnaise or vegan mayo, I added a 1/4 of an avocado. Adding curry powder to egg salad is something I started doing a couple years ago and now I don’t make egg salad without it. This particular recipe has a rich, creaminess from the avocado and a robust sweet and savory spiciness from the curry powder. The two pair together quite nicely. You can leave out the relish/pickles but I really like the flavor they add. It’s a really easy recipe and once your eggs are boiled, it comes together in no time at all. 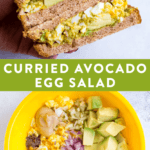 If you try this curried avocado egg salad recipe please leave a comment and star rating to let me know how it turns out. 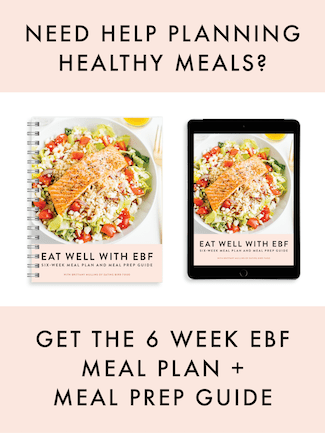 Your feedback is so helpful for me and other EBF readers who are thinking about making the recipe. 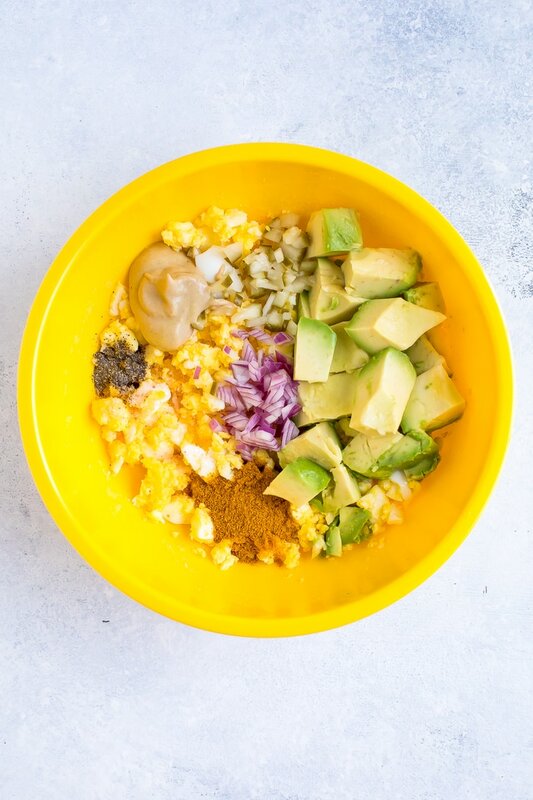 Make healthy egg salad by replacing mayo with avocado and adding curry powder for a kick! Add all ingredients into a bowl and mash together with a fork. Taste and season with additional salt and pepper. Use egg salad on salads, sandwiches or wraps. I did pita pockets with little spring mix and tomato slices. mmm this egg salad sounds better than the one i had this weekend which was supposedly supposed to be the best one in LA! Bummer! Where was the one you had this past weekend from? Yum! I can’t wait to try this with some of my leftover Easter eggs!!! 🙂 Thanks for sharing. 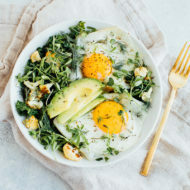 What is good: eggs have a lot of cholesterol, and avocado works against it! This will be a great recipe to have on hand, to use up all of the boiled eggs that the kids have colored. I LOVED This is 40….I cracked up laughing through the whole movie! You look so cute!!! And oh my gosh, that pizza from Fresca is SO GOOD! The greek one and the kale one are my two favorites! I love curried eggs, I also like to add a little cumin powder, a sprinkle of sweet cayenne pepper and chopped parsley. I never tried with avocado, but will give it a go. 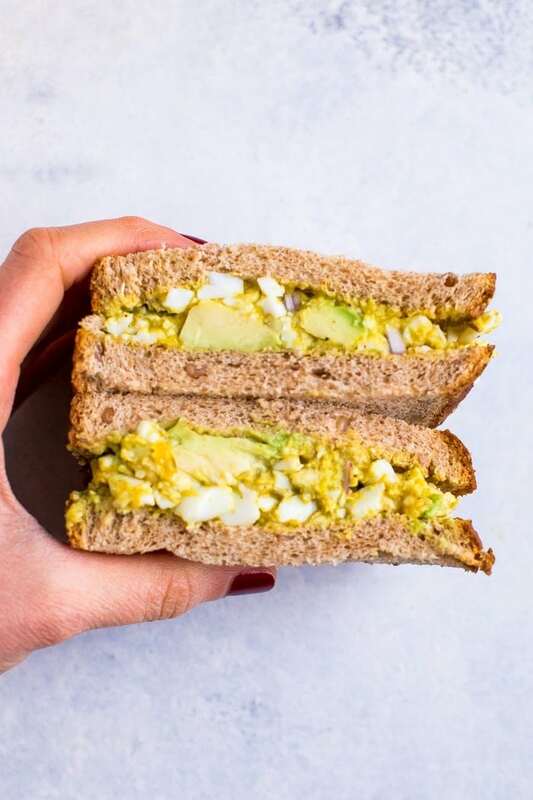 I love curried egg salad, and I just made avocado egg salad for the very first time last week! I’ll have to merge the two together soon. Thanks! 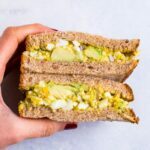 I LOVE avocado and egg salad!! 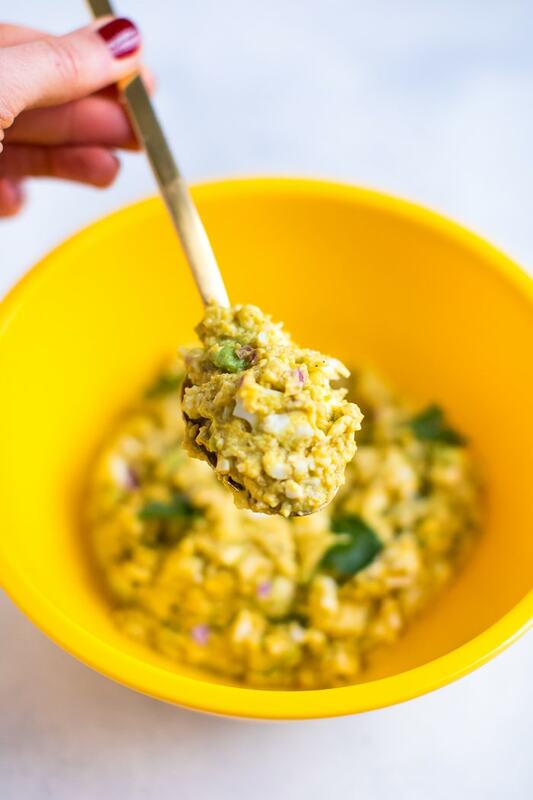 I also love curry spice so this egg salad is right up my alley, I cannot wait to try it! I have been craving egg salad like a crazy lady for some reason this week. Must be all the easter eggs or something, but I was putting off making it since I really didn’t want to eat the fatty mayo. This looks EVEN better and obviously much healthier, thanks for sharing, I cannot wait to try it. I love egg salad-it reminds me of my childhood. I used to make a tofu salad with avocado and curry; I will have to try it with the eggs though since I’m no longer eating soy! I don’ t make egg salad, since it’s not vegan, but I have made a polenta scramble that had an eggy texture and flavor. I bet mixing in some curry powder and avocado would be just delicious! WOW, that pizza looks darn good!! 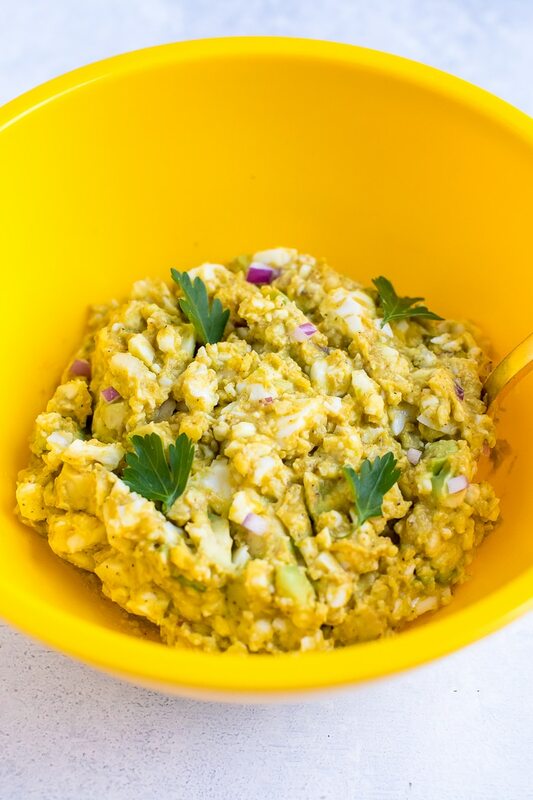 Your curried avocado egg salad sounds delicious, too! I am convinced that eggs and avocado make for one of the best combos, and the addition of curry sounds tasty. Thanks for sharing :). p.s. Live in Richmond, love your blog, am a total health nut, can’t wait to run into you someday! I nearly tackled the Petersiks when I saw them in Home Depot. Real talk. Yay! So glad that you liked it Catherine. So good! I have finally gotten over my fear of Curry and now I can’t get enough of it. I am not one who likes eggs unless they are hard boiled so I was very intrigued when I saw this. Thanks or sharing something so delicious and simple. Made this today– absolutely amazing! The curry adds such a delicious flavour that a regular egg salad just can’t beat! One suggestion, though: make sure your measuring spoons are available to use, otherwise you might add too much vinegar.